Homemade Empire, Wolf In Loveland, Soldier&apos;s Heart, H-Sik and Wolvon. This is a mixtape of the unique artists playing our Woot! Woot! 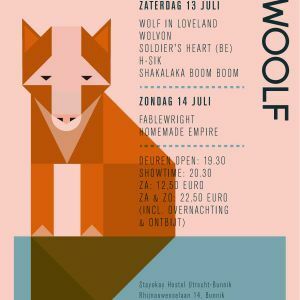 Woolf festival (July 13th, Utrecht, NL). Really proud of this edition&apos;s line-up. The quiet folk of Wolf In Loveland, the dark surrealistic stories of mr Homemade Empire, the weird improvised live electronica of H-SIK, the charming electropop of Soldier&apos;s Heart, the emotionally charged noiserock of Wolvon, this edition is our strongest so far. Enjoy!